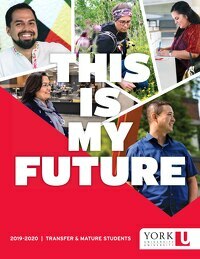 Transfer Connect is a web resource for York University transfer applicants. Student representatives will guide you through the transfer process at York by answering questions about your offer of admission and transfer credit statement. Chat with a York transfer credit representative using instant messaging on Adobe Connect. Book an appointment here. When will my conditional offer become official? Will changing my program affect my transfer credits? What is a general education credit? Can you help explain my transfer credit statement? What is a course exclusion? What is an enrolment appointment? When and how do I pay my student fees? Need your transfer credit statement in time for enrolment? Visit MyFile to access a printable copy. Current students can access their transfer credit statement via the Office of the Registrar. Hey all! My name is Sienna. I’d liked to introduce myself by sharing my York story. I had always dreamt of studying at York University, but once I graduated from high school, life and other responsibilities unfolded. I began working in many industries but none of them felt quite right; so, I made the decision to return to school at 26 to pursue an Honours Bachelor of Health Studies (BHS) while balancing a small child, a house and bills. At first, I was a little nervous about returning to school, but I was also excited to start my life, create my future and show my son that greatness can be achieved no matter how difficult the road may seem. I am currently completing my first year at York, and I have been energized by university life and opportunities that have made me feel part of a community. I can answer any questions you might have about transferring to York, available supports and services, commuting and career opportunities. Hi! My name is Hannah, and I would like to share my York story with you. When I was in my senior year of high school, I decided to visit Glendon, York’s bilingual campus. During my visit, I discovered that the Honours Bachelor of Arts degree in Translation, and the Certificate in Technical and Professional Communication were perfect for me. I chose York because I knew I would be able to pursue my passion for languages and continue to develop my bilingualism. I was nervous about starting a new chapter in my life, but excited to take advantage of the endless opportunities within arm’s reach. Beyond classes, getting involved was one of the best decisions I made as it really added to my experience at York. Throughout my studies and extracurricular activities, I met people who I shared new experiences and memories with, and who I turned to in difficult times. I am currently in my final year of Translation and I cannot imagine having spent these past four years at York any other way. After I graduate, I plan to work in the Translation industry and hope to return to York to pursue a second degree in Education. As a Transfer Connect representative, I can be of help to you with your transfer to York. Feel free to ask any questions you may have about my experience, transfer credits, commuting and available support services. Curious how to make money while studying? Attend our online webinar this wednesday to find out how. Registration is still open. Congratulations to @YorkUeducation professor Mario Di Paolantonio who has been awarded a Visiting Professorship at the Sciences Politiques Toulouse (@SciencesPo_Tlse) in France! Congratulations to the outstanding students recognized with the @GlendonCampus Student Engagement Awards! This year, student leaders were recognized for their academic merit, contributions in their community and the legacy they have built at Glendon! Join @EnvironmentYork in celebrating 50 years of global research, dynamic teaching and experiential education at the FES 50th Anniversary: Day of Celebration event on April 24th!